[Update: The Wall Street Journal has made this official, confirming that in late 2009, Gearbox had picked up the title in order to complete it. "Clearly the game hadn't been finished at 3D Realms, but a lot of content had been created," Gearbox's Randy Pitchford told the Wall Street Journal. "The approach and investment and process at 3D Realms didn't quite make it and it cracked at the end. With Gearbox Software, we brought all those pieces together. It's the game it was meant to be." 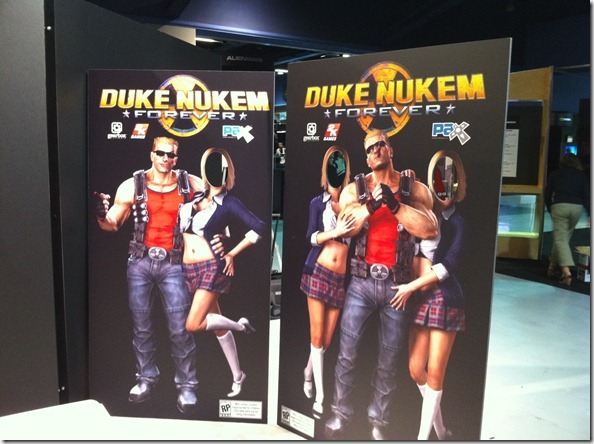 Yes, as rumored, Duke Nukem Forever is at PAX in Seattle this week. Reports are coming in from all over that the the game has its own booth, including cardboard standees with cutouts for faces -- your faces, if you're at PAX -- for photo opportunities. And what's that we see? Oh yes, the Gearbox logo. Fancy seeing that there. Earlier today, Gearbox's Mikey Neuman tweeted a photo of CEO and President Randy Pitchford wearing a Duke Nukem shirt. You see where this is going. 2K is on the verge of making a very special announcement, so we'll have more details soon. In the meantime, shake it baby -- Duke's back.